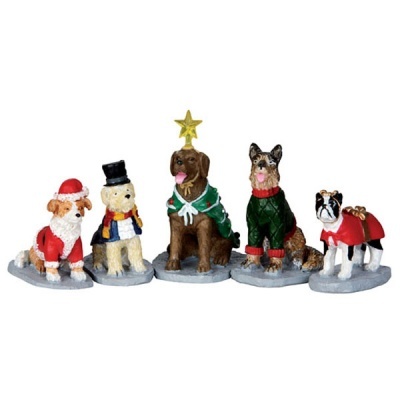 Lemax Costumed Canines Figurines Set of 5 depicts a parade of dogs each individually dressed in festive costumes by their owners for a Christmas photograph. A Lemax Village Christmas themed figurine set which joined the Lemax collection in 2014. Comprises five individual hand painted polyresin figures on five individual bases to compliment your seasonal Lemax Village display.